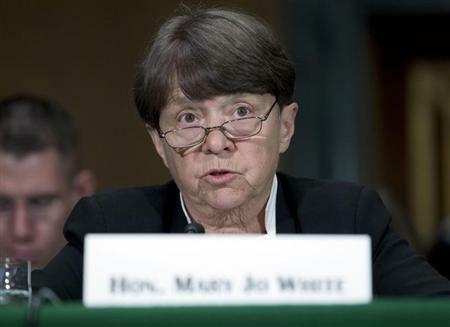 WASHINGTON/NEW YORK (Reuters) - The U.S. Securities and Exchange Commission has several active investigations into possible wrongdoing by high-frequency stock traders and other equity market structure issues, SEC Chair Mary Jo White said Tuesday. "We currently have... a number of ongoing investigations regarding various market integrity and structure issues, including high-frequency traders and automated trading," White told a U.S. House of Representatives appropriations panel. "We are very much focused on any abuses in that space." On Monday, the FBI confirmed it has been conducting a wide-ranging probe into high-speed trading for months, an outgrowth from the years-long crackdown on insider-trading. An FBI spokesman who did not wish to be named said Monday night that the bureau was investigating whether high-frequency traders are front-running others' trades by getting to exchanges first. A big trade, such as a bank shorting a million shares of a company under investigation, could be considered a material event, the spokesman added. A person familiar with the FBI probe told Reuters on Tuesday that the FBI is also looking at areas such as whether high-speed firms can cut the line in terms of how security orders are placed or are engaged in "spoofing" trades that are not really trades to give the illusion of market activity. White declined to answer questions from Reuters on the sidelines of the hearing about whether the SEC's probes are exploring similar topics as the FBI's. The long-running debate about high-frequency trading intensified on Monday, after bestselling author Michael Lewis published a new book, "Flash Boys: A Wall Street Revolt." The book contends that high-speed traders have rigged the stock market, profiting from trades made at a speed unavailable to ordinary investors. Proponents of high-speed trading have criticized the book, saying high-speed traders actually benefit other investors by providing liquidity to the market. For years, the SEC has been looking into high-speed trading and "dark pool" trading, which takes place away from major exchanges. Regulators hope to determine whether ordinary investors are at an unfair disadvantage to high-speed traders, who rapidly dart in and out of trades to earn fractions of a penny that add up to big profits over time. In the last year, the SEC started subscribing to the same proprietary data trading feeds that the high-speed traders use, hoping to better understand how the markets are functioning. White told lawmakers the SEC has not yet reached any conclusions on what, if any, new rules might be needed. "Our approach at the SEC...is to be data-driven and disciplined to determine where high-frequency traders fit into the range of market quality issues," she said. White also told lawmakers the SEC needs more money in order to keep on top of the rapidly changing market technologies so it can police the markets. "Detecting misconduct in constantly evolving securities markets, including as a result of the growth of algorithmic, automated trading and 'dark pools,' requires substantial resources," she said. The SEC is seeking a $1.7 billion budget for fiscal 2015, up from its current budget of $1.35 billion. But Congress is not expected to pass a budget any time soon because the Senate, controlled by Democrats and the House of Representatives, controlled by Republicans, already struck a spending deal.